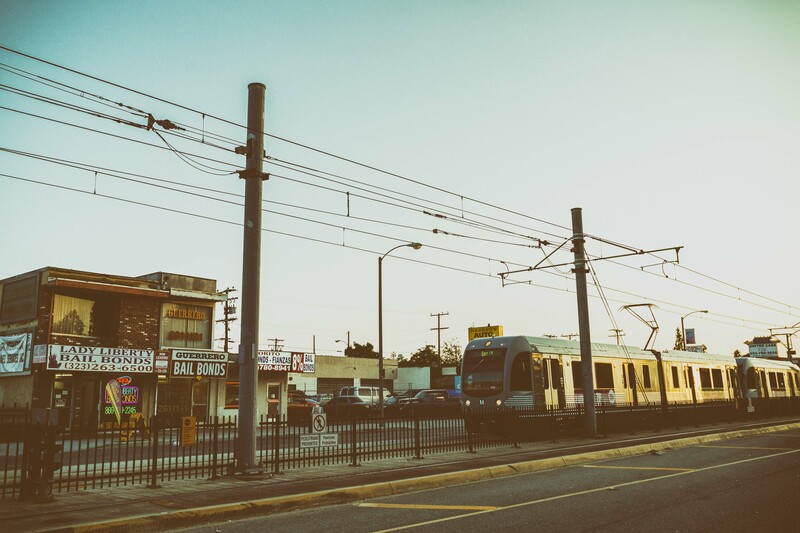 An eastbound Gold Line train heads toward its East L.A. terminus on a recent evening. Photo by Steve Hymon/Metro. A nice look at Ledaya Epps, a 37-year-old Compton resident who was hired as a construction apprentice on the Crenshaw/LAX Line project because of Metro’s novel Project Labor Agreement. The policy ensures that some jobs on the project are set aside for residents of economically disadvantaged areas (it doesn’t target particular localities, which is prohibited by federal law). Click here to learn more about the PLA, including information about how to apply for a job and/or apprenticeship. CicLAvia comes to the San Fernando Valley in 2015, with a route likely to include Lankershim Boulevard and Ventura Boulevard. The date still needs to be finalized but one thing is for sure: the primary transit access to the route will be the NoHo stations for the Red Line and Orange Line. A comprehensive study is underway on computer systems that allow vehicles to monitor the locations of other nearby vehicles — and thus trigger an automatic response (such as speeding up or slowing down) to avoid accidents. The U.S. Department of Transportation this week announced that it was beginning the process of requiring all cars to be outfitted with the technology. The technology could be used in cars piloted by people. Arrests increased 69 percent between 2008 and 2013, the Daily News reports, while the number of court summons is down 28 percent in the same time. Of the 120,000 cases that have been resolved, almost one-third resulted in jail time — meaning fare evasion is one of the top crimes that lands people behind bars in Gotham. The New York MTA says that fare evasion costs the agency about $100 million annually. The article includes graphics on arrests by gender, race and age — and also raises questions about whether prison time is doled out fairly to those of different races. Efforts to keep clean entrances and exits to the downtown Civic Center Station appear to be outpaced by those using the stairs as trash cans and restrooms. While the station is closed in the early morning hours, the stairs remain accessible 24 hours a day. Complicating matters is a significant homeless population that frequents the area. Nice essay on the gray wolf that trotted into far northern California from Oregon and wandered parts of the state for 15 months without being seen — despite traveling 3,000 miles, crossing roads and coming within howling distance of the 5 freeway. The wolf (outfitted with a GPS collar) has since returned to Oregon and has apparently fathered pups. If the MTA in NYC can do something about fare evasion why can’t Los Angeles? People know they can get away with it and nothing will happen so they continue to do it. When does our MTA do something about this situation? One point of the Post’s story about fare evasion in the Big Apple is that the New York MTA is struggling to keep it lower and is losing millions of dollars each year on it. Love the processing on the photo! On one hand, we have NYC, where the vast majority of the NYers take transit everyday. NYCMTA constantly raises their flat rate fares over and over again all the while losing millions of dollars each year through fare evasion. It’s farebox recovery ratio is barely 50%. The more people get arrested through fare evasion, in the end, it comes back to levying more burden taxpayers with log-jammed justice system and ever crowding jails. On the other hand, we have cities like Tokyo, Seoul, Taipei, Hong Kong, and Singapore, another fine example of cities where millions take transit everyday. Cities where they have never raised their cheaply rated distance based fares, fare evasion is tightly controlled with a strict tap-in/tap-out fare structure with automated fare gates, and it makes the highest farebox recovery ratios in the world, over 100%, practically capable of running their operations just from their farebox recovery ratios alone, something that no US transit agency can possibly ever achieve. American transit model does not work and is a complete failure. The supposed best transit system in the US itself is in shambles. We need to start learning from the Asians on how to run and operate mass transit. It would be nice if Metro steam cleaned the entrance area of the Civic Center Station once in a while. It absolutely reeks of urine. Don’t forget Pershing Square. It’s even worse.